Jesseca Ferguson is one of the photographers whose work is in Depth of Field, 2015. Rfotofolio is pleased to share the work and words of artist Jesseca Ferguson. Of course – I’d be happy to give you some background info. Thanks for your interest in my work. I am honored to have my work included on your site. First of all, I need to explain that I am an artist who uses photography – I don’t really feel I am a photographer, as I have never taken a photo class and do not come from a photo background. You could certainly call me a pinhole photographer – that works! I feel I am a bricoleur, a visual arts handyman/handywoman if you will. I am an assembler and arranger – whether of objects to photograph, or of materials (including photographs) to collage/connect together. I had been making collages and drawings for a while, having started out as a weaver and hand papermaker. In the late 1980’s I was using found images: old photo postcards, images culled from old books, cartes de visite, and 19th century travel photos. I was frustrated by their small sizes and thought there must be some way to make my own photos, at a larger scale. Thanks to the kindness of photographer friends, I found my way to pinhole photography and handmade photo processes. I especially want to thank Eric Renner for his help and encouragement when I first began working with pinhole cameras in 1991 and along the way ever since then. He published some of my early images in “Pinhole Journal” and included my images in his wonderfully informative book,Pinhole Photography: Rediscovering a Historic Technique. Eric has supported many pinhole photographers in this way. By strange coincidence, when I was in art school (Massachusetts College of Art and Design BFA 1981, in Fibers), I had a part-time job at the Clarence Kennedy Gallery at Polaroid, in Cambridge, MA. I had the privilege of working for Linda Benedict-Jones, the gallery director. Linda is now Curator of Photography at the Carnegie Museum in Pittsburgh, after being director of Silver Eye Gallery, also in Pittsburgh. At the time I had no interest in photography other than to document my own work with slides. However, I really enjoyed the images on view in the gallery while I worked there – David Hockney’s photo collages, Julia Margaret Cameron’s portraits, Robert Mapplethorpe’s images self-portraits, etc. I was exposed to the treasures in the Polaroid Collection, which was housed behind the gallery. I never dreamed that I would later work in photography myself, even using the Polaroid 20×24 camera as a pinhole camera on several occasions! Polaroid supported my pinhole work with several film grants, acquired my images for their collection, put my images on their website, etc. I will always be grateful for their help. Horst Janssen, Hans Memling, Joseph Beuys, Anselm Kiefer, Joseph Cornell, Betye Saar, Alison Saar, Lenore Tawney, Michelle Stuart, Jim Hodges, Charles Ledray, Tim Rollins and K.O.S. ( Kids of Survival). Josef Sudek, Duane Michals, Bogdan Konopka, Eugene Atget, Jacques Henri Lartigue, Rinko Kawauchi, Anna Atkins, William Henry Fox Talbot, Rosamond Purcell, Gertrude Kasebier, Masao Yamamoto, John Dugdale, Pinky Bass, John O’Reilly (collage artist as well). A dear mentor figure for me and many others was the late John Wood (1922-2012). John was a photographer, printmaker, watercolorist, draftsman, book artist, political conscience, whittler, teacher and visual poet. I was lucky enough to take a workshop with him at Visual Studies Workshop in Rochester in 1989 or 1990. What he taught us in that week was, for me at that time in my life, truly life-changing. Seeing him and his work over the years was very special. “On the Edge of Clear Meaning (2009)” is a complete catalogue of his work (and includes a DVD of interviews, etc.) which accompanied several retrospectives at the end of his life. I respond to a quality of light and darkness in the work, often with an implied or overt narrative. These artists all exhibit devotion and dedication to their studios, plus a deep sensitivity to the human condition in general. I am most compelled by artists who experiment with materials (especially artist books and images) in order to tell their story – not simply for the sake of experimentation or trendiness. I seek out work that calls me back to look at it again – work that reveals itself to me over time, inviting me to ponder it further. Josef Sudek’s life-long series of images taken in his studio are unforgettable. They are more about a mood or an atmosphere or a state of mind than about any specific place or object. I also am moved by Hippolyte Bayard’s self-portrait as a drowned man – so ahead of its time! A very special favorite is John Adams Whipple’s 1852 daguerreotype of the moon taken through a telescope at Harvard Observatory. Sometimes the perfect day does not even involve photography. That day may involve scouting around at a flea market or in a used bookstore for materials. The hunt for items I can use is another form of studio work for me. Or when I find a paper that works well – at last! – for whatever it is that I am trying to print, make, or do. Recently I had a wonderful day which involved going to a local museum with an artist friend, talking about what we had seen, then coming back to the studio to experiment with gum prints, having coffee, talking some more. I see each day like a bead in a necklace: all contribute to the beauty of the whole. No one day is any more perfect than any other. Please tell us about your cyanotypes. “Simple ain’t easy” comes to mind when I think of cyanotype, which many people dismiss as a technique for beginners or kids. Yes, it is easy to get some kind of an image with cyanotype – but a good, compelling, well-printed and nuanced image? Therein lies the challenge! Anna Atkins is my heroine – the first woman photographer, who self-published the first photographically illustrated book in 1843: Photographs of British Algae: Cyanotype Impressions printed exquisitely in cyanotype. And cyanotype was truly cutting edge photo technology as it had only been discovered by Sir John Herschel in 1842! I love the simplicity of cyanotype photograms (used in a recent artist book I made for Al-Mutanabbi Street Starts Here) but getting perfect tonal ranges with classic cyanotype can involve dodging & burning . . . . I love the Ware method but have had limited success mixing it myself, so stick with the classic version. Paper choices are critical. Recently I have discovered new papers (cotton & linen) from Ruscombe Mills in France – beautiful for printing cyanotype but alas expensive! When I am wearing my pinhole photography hat, I worry about the disappearance of large format B&W film, which is what I have been using for years – and also the chemistry to process it (which I do myself). Yes, films are disappearing! I am also working with gum printing a bit lately – new challenges there – technical and otherwise. I am reading various books for paper recommendations, advice, etc. Fun to do the research and try to get a technique to work for a project you have in mind. I find this a very exciting time because we can hybridize techniques from the 19th, 20th, and 21st centuries. The renaissance in handmade processes – the classic versions or the reconfigured new versions – plus digital technologies, the invention of new papers – I find it all very lively and invigorating. In some ways, our time is a lot like the days surrounding the invention of photography: new technical advances, techniques becoming obsolete as others come along. Today there are many people now who have never seen or used film, and for whom the terms negative/positive mean nothing in terms of how the image is built. When these people have a chance to contact print – even with a digital negative – there can be a true “aha” moment. Sometimes I worry that the sheer instantness of digital imagery, and always seeing images on a screen, may rob the art form of its tactile qualities. Is there an impoverishment here? Yet –then I see the work of Ori Gerscht and others, and am intrigued. People have always yearned for an image of the absent beloved or what is in the past (person, location, event). This desire sparked the invention of photography (which evolved from painted miniatures, in a sense). I am sure that photography will continue to evolve in new and exciting ways that we cannot even imagine today. Interestingly, hand-held computers/phones are about the size and weight of early daguerreotypes or ambrotypes in cases, but I think rapid fire viewing (and photographing) with one’s phone is very different from the more formal processes of making, taking, and viewing photos in earlier eras. A good question for any artist! Are you asking about “what do I do when I am stuck – technically or aesthetically – when in the midst of a particular project? Or do you mean when I am in some form of stasis between projects? Either way – my solutions are similar. I like to go to museums or galleries, or spend some time with books – old favorites and new names as well. Roaming around, looking at things – not necessarily photography. Also I like to speak with other artist friends, go to a gallery together, or maybe visit them in their studios to see what they are up to. Some “down time” is necessary, but that is not necessarily a “creative block.” I like to refuel and refresh the mind, the eyes, and the soul periodically. Listening to music and reading can help also, as can travel. Cleaning up my studio is also another good way to make room for something new. I am a big believer in cultural diplomacy. I think that making and/or exhibiting art together is a wonderful way to connect people across boundaries and borders of all kinds – linguistic, cultural, ideological. (Daniel Barenboim conducting concerts with Arabs, Israelis, Germans come to mind.) I have been involved with pinhole photography exchanges with Polish photographers since 1998, and have found that experience to be eye, mind, and heart opening. In 2013, I became involved with Al-Mutanabbi Street Starts Here, an ongoing international book arts project commemorating the 2007 car bombing of Baghdad’s legendary street of booksellers. I have connected me with international book artists. Thank you Jesseca for sharing your work and words. 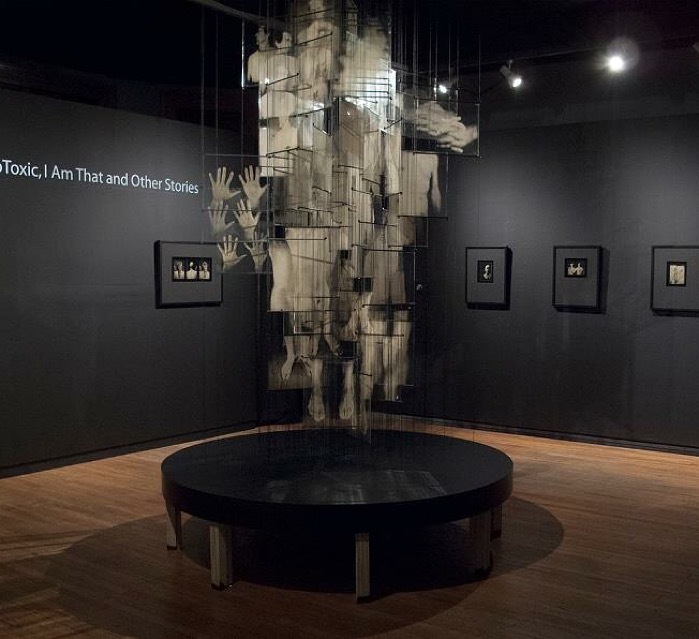 To learn more about Jesseca Ferguson’s work please visit her site at,The Museum of Memory. To learn more about the work of Josef Sudek please visit Atelier Josefa Sudka .